In the absence of personal recommendations, searching for an insurance agent can be as easy as typing a couple words into a smartphone. Submit a brief query into Google and you’ve got a digital rolodex of agencies to choose from. But, with so many options, how are prospects supposed to choose one over another? That’s where online reviews come in – providing consumers with feedback to help them whittle down the field. Anymore, people expect honest feedback when researching products or services. It’s given considerable power to the consumer—even a single review can have a dramatic impact on sales. In particular, online reviews are extremely valuable for insurance agencies. This is due to the large gap between consumer expectations and what most agencies are actually providing in regard to the number and quality of reviews. People expect to see at least a star-rating before they decide to explore further. But, in reality, the vast majority (80-90%) of insurance agencies have three reviews or less—with many having none at all. The absence of local reviews across the internet provides a huge opportunity for agencies that do have positive reviews to stand out. Inevitably, most prospects online will pick the agency that others have already vetted out. As a result, the agencies with several positive reviews are regularly displayed and chosen above those with negative ratings, or none at all. It makes perfect sense. People want to know what they’re getting themselves into, and they will regularly trust online review sites to give them the answers. Positive online reviews are a form of referral that increase both the credibility and visibility of businesses on the internet. Recent studies show that an increasing number of people rely on online reviews to help them make a purchase decision. So every day they are growing in relevance. Online reviews never expire. They are always there, waiting to be read by prospects searching online. Consider how online reviews impact the buying decision making process. After a consumer realizes they have a need for insurance many use the internet to search for viable options. Because online reviews have a positive impact on local SEO, agencies with several online reviews will likely be discovered first. Consumers will also use online reviews as social proof to judge the credibility of the agency. Research shows that businesses increase their online conversion by 58% when they have 5 or more fresh online reviews. When they reach 10 online reviews search traffic increases by an average of 20%. The more recent the reviews, the greater the impact in discoverability and conversion. All things considered, we estimate each online review to yield, at least, two sales for an insurance agency over a 10-year period. Online reviews are most powerful when they’re found on trusted third-party websites, where the feedback is considered unbiased. For insurance agencies, the two most important review sites are Google and Facebook. These two are plugged directly into major search engines, where most people are searching for products and services. There are also industry-specific review sites which are worth looking into. The most effective strategy involves spreading reviews out across multiple websites and social media. Sites like Google have complex algorithms that determine how businesses will rank when someone searches for relevant products/services online. One of the factors in play is the sheer number of online reviews a business has. But the quantity of reviews is less important than the overall frequency that businesses are reviewed online. An agency with 50 online reviews that are 2-years old would likely rank below an agency with 5 reviews spread out over the last 3 months—considering all other factors are equal (location, NAP consistency). As tempting as it is to collect as many online reviews as possible all at once, it could actually have a negative impact on an agency’s online ranking. Google penalizes businesses that solicit reviews in bulk, as they fear the business is intentionally distorting their online reputation. In contrast, reviews that happen over time not only appear more organic to Google’s algorithm, they look and feel more authentic as well. Google also prefers businesses with reviews that include thoughtful comments—opposed to just a star rating alone. Feedback provides value and is much more difficult to fake, so they reward listings with feedback where the client took the time to provide more specific feedback. That’s why any strategy to gather more online reviews should encourage the client to include a comment with their star rating. Because so many businesses are lacking online reviews you’d think they’d be quite difficult to obtain. Truth is, it’s quite easy to get a promoter to give positive feedback if you know how to ask. Rocket Referrals automates the steps below for our users, but they can also be performed manually. Online reviews allow a happy client to write a positive recommendation without having anyone specific in mind to refer. This significantly increases the effectiveness with a call-to-action. Whereas, to give a personal recommendation, the client must have someone personally in mind that has a need for a new insurance agent. 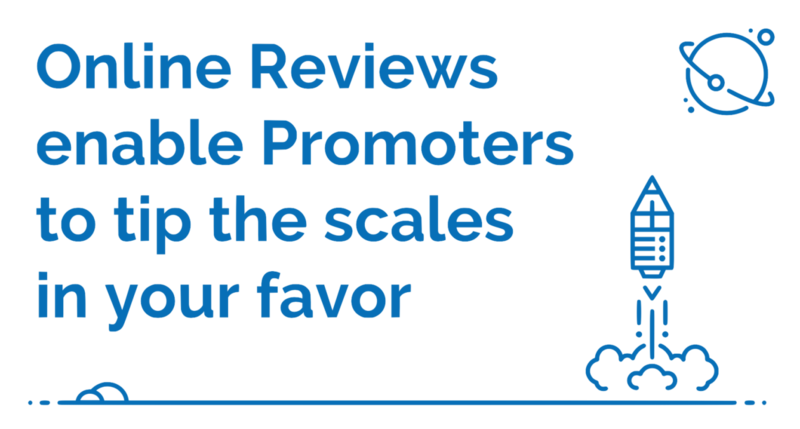 Getting more online reviews is a process that begins with identifying loyal promoters using the Net Promoter Score (NPS) across all clients. The NPS will provide you will useful information itself, but it becomes very powerful when it’s used as a stepping stone to increase conversion. For more information on how we go about collecting online reviews sign up for a demo below. Let’s get your happy clients to say great things about your agency.